The Anti-Snore mouth guard device features are discussed below. 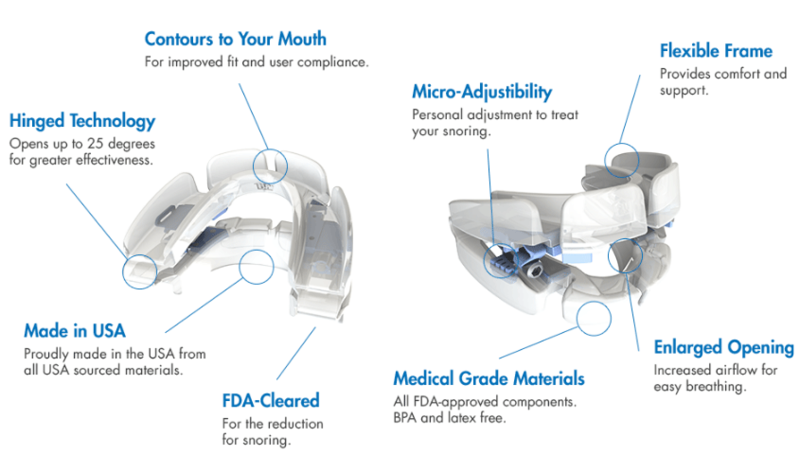 The FDA-cleared Stop-Snoring Mouthpiece uses an approved technique to stop or reduce snoring by moving the lower jaw forward. This maneuver opens the back of the throat which reduces and can stop snoring. These snoring devices work in a similar manner as oral appliances for sleep apnea but are not intended for the treatment of sleep apnea. The aveoTSD (TONGUE STABILIZING DEVICE ) anti-snoring aid was developed following several years of clinical research in the treatment of SNORING and OBSTRUCTIVE SLEEP APNEA (OSA).The aveoTSD is made from a soft medical silicone for comfort and works by holding the tongue forward by gentle suction preventing it from falling back against the back of the throat , keeping the airway open during sleep .Unlike oral dental devices , the aveoTSD does not attach to the teeth, and does not require specialist fitting by a dental professional. For maximum compliance this device is best suited for use with consultation by a medical doctor or dental professional.The aveoTSD is a non-adjustable universal device that is the most cost effective and simple to use. Approved by the F.D.A in the U.S.A as a medical device . The design of the Full Breath Solution focuses on inhibition of tongue movement; inhibiting the rise and backward movement of the tongue so that it does not block the airway during sleep. With a single arch appliance designed to provide subtle yet effective admustments, the Full Breath Solution imporves airflow 100% of the time and stops snoring with 95% of all patients. MDSA Appliance Medical Dental Sleep Appliance (MDSA) A safe and effective treatment for snoring and mild to moderate sleep apnoea. The Medical Dental Sleep Appliance (MDSA) has been developed in direct consultation with leading Australian dentists, sleep physicians and dental technicians. Low profile of the appliance allows minimum opening of the bite. The laboratory made MDSA holds the jaw and tongue forward and prevents the throat from collapsing during sleep. The results of a study at the Austin and Repatriation Medical Centre Sleep Clinic, a crossover trial comparing the MDSA, nasal CPAP and placebo confirm that this is a safe and effective treatment for snoring and mild to moderate sleep apnoea. Patient compliance and comfort was significantly greater with the MDSA than the CPAP. The MDSA is scientifically proven as an effective method for treating snoring and mild to moderate sleep apnoea. The MDSA is an alternative therapy when other treatments that involve nasal CPAP or surgery are not accepted. The O.R.M. (r) type Device is a new generation custom-made mandibular repositioning device with patented physiological articulation and unique comfortable splints to optimize patient acceptance and treatment efficacy. It is recognised by many specialists as the most discrete and comfortable mandibular advancement device available and thousands of patients recognize the benefits of this simple to use yet extremely efficient therapeutic solution. In March 2009, Narval launched the O.R.M. (r) mandibular repositioning device using the Narval CADCAM Technology (Computer Aided-Design and Computer Aided Manufacturing) by laser sintering a polymer powder. The CADCAM Technology offers more customization possibilities for the device and a greater mechanical strength. You can take it easily anywhere you go. The Nocturnal AIrway Patency Appliance (NAPA) is constructed in a dental laboratory of rigid acrylic and is tooth retained by Adam”s clasps. An anterior positioned breathing beak allows for oral breathing when necessary. The mandible is held firmly in position to prevent any jaw movement during use and , thus, is non-adjustable. The vertical opening is 5 to 10mm. Allow mouth breathing to occur, if required. Maintain maximize the intraoral volume. Minimize the force on the teeth. Have no components that extend extra orally through the lips. To reduce upper airway resistance. THE OASYS ORAL/NASAL AIRWAY SYSTEM REDUCES THE FORCES ON THE TEETH BY DESIGN. The OASYS Oral/Nasal Airway System fits securely onto the lower arch only. The upper flange extends in front of the upper arch and under the upper lip. This maintains a slippage during mandibular movements during usage. There is a nature give to the wires that creates a yielding give when the mandible pulls back on the device. Provided is an upper splint that distributes the forces through the entire arch. Together these act to reduce the forces on the teeth. The OASYS Oral/Nasal Airway System maintains maximal tongue space by positioning the connectors and adjustment components outside of the dental arch leaving the palate and anterior oral space completely free for the tongue to position itself up and forward. There is usually even an open space for the tip of the tongue to go between the incisor teeth. Oral/Nasal Airway System maintains the patentcy of the oropharyngeal airway by functioning as a mandibular repositioner and as a nasal dilator by maintaining a stretch in the nasal labial tissue to dilate the internal nares. The Silencer Professional is a laboratory fabricated fully adjustable oral appliance for the treatment of sleep apnea and snoring. The appliance features a titanium precision attachment, which controls the anatomical settings of the appliance. It is capable of anteroposterior adjustment as well as vertical adjustment through a range of 10mm, in both dimensions. The design of the precision attachment also allows lateral movement of the mandible which respects and protects the TMJ. The titanium Halstrom Hinge(r) is made of implant grade titanium and carries a five-year warranty. There are three component materials in the Silencer. The body of the appliance is constructed of elastamer,a pliable material which offers the patient a much greater degree of comfort than harder acrylic materials. For additional support, to the dentition as well as the temperomandibular joint, hard acrylic bite pads are placed in the molar regions. A commercially pure titanium articulating component grants the appliance the many adjustment characteristics that make the Silencer unique – kind to the tissues, the teeth, and the temperomandibular joint. The SnoreSilencer(tm) Pro is an easy-to-use and comfortable heat-and-fit mandibular advancement device, for the reduction or elimination of snoring and/or to treat OSA. Patients can take it home the same day it is fit. For patients considering a mandibular advancement device, the SnoreSilencer Pro is a quick and cost-effective introduction to the technology. The device is also an alternative for noncompliant CPAP users or those who want a more accessible treatment alternative when traveling. With its patented hinge technology and soft pliable material, the device is close to custom in comfort and ability to adjust jaw advancement, without the long waiting period for lab fabrication. The unique Precision 3 Advancement System uses three separate lower trays, each with a fixed pin setting. This facilitates three different advancement levels to help patients can reach a most satisfactory level of treatment. The SnoreFree is a one-piece thermoplastic mandibular repositioning appliance that is made chairside. It comes in a kit that contains everything from complete instructions, to all the forms necessary to screen your patients for snoring and apnea. When you need an appliance to bring the tongue forward and clear the airway in the hypopharyngeal region, this appliance is a good one to use first as it is inexpensive, and it’s easy to use. The SNOR-X is a mouth guard that gently holds the tongue forward during sleep, keeping the upper airway open and free from obstruction. The prevention of this obstruction relieves snoring. SNOR-X is made of two pieces, a tongue sleeve and a plastic ring that goes around the device and is held in place by notches on each side of the sleeve. The patient places their tongue into the tongue sleeve and squeezes the front end of the device to create a gentle suction that holds the tongue in an extended position. The patient can adjust the extension of the tongue for comfort and effectiveness. Air vents are sculpted onto the upper surface of the device to facilitate mouth breathing. The SNOR-X is constructed of medical grade silicone , requires no laboratory fabrication and is available in several stock sizes. It maintains tongue protrusion by way of negative pressure created in the anterior vacuum bulb. An extraoral lip guard prevents retrolapse of the tongue during sleep and also allows for a degree of protrusive adjustability of the tongue. The SNOR-X is not retained on the teeth in any manner and allows total freedom of movement. The SomnoDent MAS is a custom-made device, consisting of upper and lower dental plates with a unique patented fin-coupling component, which allows normal mouth opening and closing. If required, a part can be added to make the device adjustable. This feature provides incremental and adjustable levels of lower jaw advancement, which improves the effectiveness and comfort-level of treatment as the jaw is moved only as far as is required to alleviate snoring and reduce OSA. Key features and benefits of the device include: Permits normal mouth opening Allows speech and drinking Provides full lip-seal Easily adjustable Safe and effective Clinically proven Custom-fitted Additionally, the SomnoDent MAS is made from durable fade-proof acrylic that retains its shape and color for at least four-five years and is covered by a two year manufacturer”s warranty. Continuous Open Airway Therapy (COAT) – is SomnoMed’s oral appliance for sleep apnea. Dental lab made two-part mandibular adjustable positioner to treat snoring and mild to moderate sleep apnoea. The SomnoGuard AP Pro can easily be constructed from common acrylic/elastomeric thermoform dental materials in any detal lab after taking impressions of the lower and upper jaws and producing plaster models. The components used to connect the upper and lower trays of the dental appliance and enable the infinite advancement of the lower jaw are made from stainless steel. The components” technology is based on the preceding development of the SomnoGuard AP. The components are very durable, more or less inndestructable, inexpensive and can most often be reused when the oral appliance has to re-made for some reason. As well as the advantages of the SomnoGuard AP, the dental device SomnoGuard AP Pro provides the additional benefit that even patients with missing teeth or dentures can wear it. SomnoGuard AP Pro is considered for long term use between about three to five years or longer. The Thornton Adjustable Positioner (TAP) is a custom-made two piece adjustable appliance that is worn while sleeping. The trays of the appliance snap over the upper and lower teeth and hook together. The design is based on the same principle as cardiopulmonary resuscitation, CPR. The airway must be opened to allow air to pass through the throat. The TAP holds the lower jaw in a forward position so that it does not shift nor fall open during the night. This prevents the airway from collapsing. The more you pull your jaw forward, the more your airway will open. The TAP is the only mandibular advancement device that can be adjusted easily by the patient or practitioner while in the mouth. This feature allows the patient to always be in control of their treatment. The unique design also allows the patient to fine-tune their treatment position at home to achieve maximum results. Most patients experience relief the very first night they wear their TAP. Although it may take up to a week to get used to wearing a TAP appliance, this is a small hurdle for patients. Nine in ten patients wear the device all night, every night  making the TAP a highly effective solution for both snoring and sleep apnea. December 2014 the FDA has cleared/approved the Adjustable TheraSnore for the treatment of Obstructive Sleep Apnea.The FDA 510(k) approval is K140663. I have both obstructive and central apnea. Just wondering how effective a device is with central apnea. My Dr. says the central apnea is more pronounced in my case than the obstructive. It probably will not be effective for central apnea as that is occurring from the brain not sending proper signals to the muscles that control breathing. My dentist did plastic-like, custom moldings with wide, rubbarized bands that can be interchanged. While the office refers to it as a ‘snoreguard,’ it sounds like the ‘EMA’ device. I got it as an alternative to the cpap for milder apnea. I am very disappointed in that the rubberized bands tear easily as well as, it has not helped my apnea one bit. Worst is what I was charged – they originally quoted me at $5,000, billable to my insurance & said my out of pocket would be no more than $1700. They have since billed my insurance for $9,000, who paid just $1100… and are billing me an additional $5,000! And, again…zero apnea relief!!! Wow, what a rip-off! The custom fitted Glidewell silentnite anti snore mouth guard was less than $500 from my dentist. My main objection to it is the replacement crosslinks are $15 from my dentist, and there are only 4 links of a particular length included on the plastic molding that you get for that money, so I’m paying a little under $4 per link for a cheap looking plastic injection molded thing. So far, I have needed to replace one every few weeks of use. I suppose that it depends on the individual and how much strain they place on the links while sleeping. Still….better than thousands of dollars if it works about the same. I knew nothing about sleep apnea before reading this article. It was interesting to learn that these type of appliances can help you to control snoring. We are planning on going on a road trip soon so hopefully this article can help me to avoid being a burden during the trip. I use a TAP. Fitted by my dentist. My cost was around 500.00. The plastic breaks down and discoloration occurs in about a year. Otherwise great relief! Can’t sleep without it! I still have a little snore that breaks through, but the apnea is gone. would appreciate a price estimate for a TAP. Just got one and mine was about $2500. Is it working? How severe is your sleep apnea?